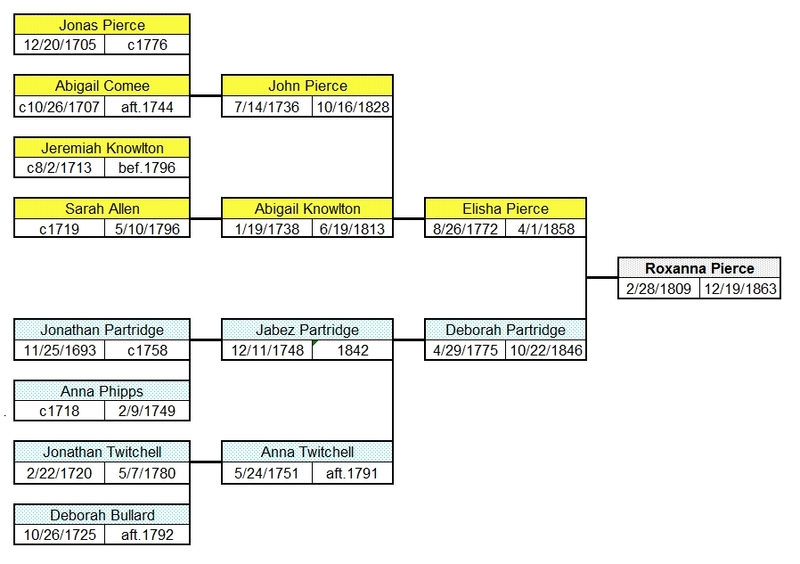 Roxanna was the granddaughter of settler Jabez Partridge. Lydia initially married and had children with Austin Stockwell in Templeton MA. * The Gardner histories list him as Josiah H Holden. Descendants of Joshua Hemenway Holden. 1. JOSHUA HEMENWAY5 HOLDEN (JOSHUA4, DAVID3, JOHN2, STEPHEN1) was born Abt. 1803 in Charlestown MA, and died 04 Jul 1868 in Gardner MA. He married (1) ROXANNA PIERCE 11 Jan 1829 in int Gardner MA, daughter of ELISHA PIERCE and DEBORAH PARTRIDGE. She was born 28 Feb 1809 in Westminster MA, and died 19 Dec 1863 in Gardner MA. He married (2) LYDIA BUSH 26 Jan 1865 in Templeton MA, daughter of STEPHEN BUSH and LUCY TAYNTOR. She was born Abt. 1808 in Templeton MA, and died 17 Sep 1884 in Gardner MA. 2. i. FRANCIS6 HOLDEN, b. 12 Jun 1830, Westminster MA; d. 1862, Andersonville GA.
3. ii. HARRIET HOLDEN, b. 05 Nov 1831, Gardner MA; d. 20 Mar 1915, Belchertown MA. 4. iii. THEODORE A HOLDEN, b. Dec 1834, Gardner MA; d. Aft. 1910. 5. iv. JOHN H HOLDEN, b. Abt. 1842, MA; d. Bet. 1880 - 1900.
v. R SALINA HOLDEN, b. 19 Aug 1843, Gardner MA; d. 13 Jan 1858, Gardner MA. 6. vi. HORACE NELSON HOLDEN, b. 03 Jul 1846, Gardner MA; d. 29 Jan 1906, Boston MA. 2. 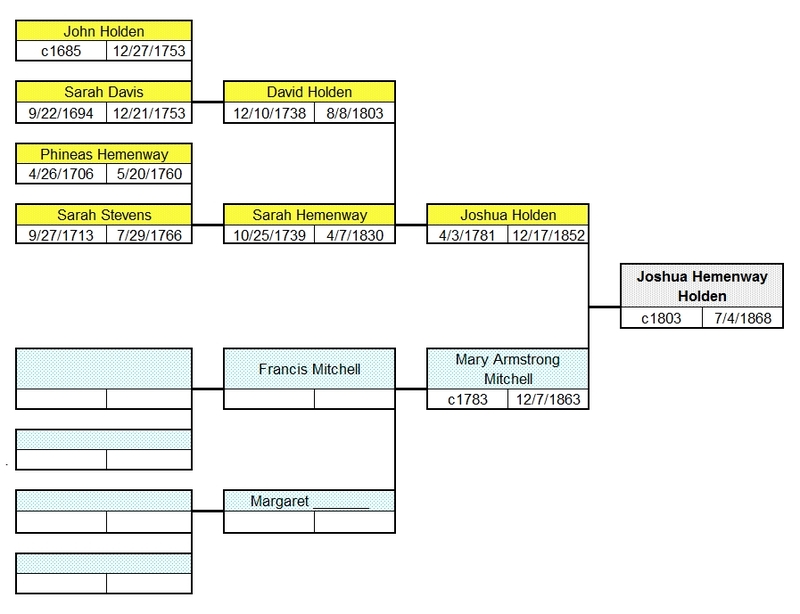 FRANCIS6 HOLDEN (JOSHUA HEMENWAY5, JOSHUA4, DAVID3, JOHN2, STEPHEN1) was born 12 Jun 1830 in Westminster MA, and died 1862 in Andersonville GA. He married ABIGAIL B STOCKWELL 04 Nov 1852 in MA, daughter of AUSTIN STOCKWELL and LYDIA BUSH. She was born 07 Jun 1831 in Templeton MA, and died 30 Apr 1903 in Gardner MA. 7. i. ELLA MARIA7 HOLDEN, b. 30 Nov 1853, Gardner MA; d. 1926. 3. HARRIET6 HOLDEN (JOSHUA HEMENWAY5, JOSHUA4, DAVID3, JOHN2, STEPHEN1) was born 05 Nov 1831 in Gardner MA, and died 20 Mar 1915 in Belchertown MA. She married (1) GEORGE LEANDER COWEE 13 Dec 1849 in Gardner MA, son of GEORGE COWEE and LEONORA GREENWOOD. He was born 07 Jun 1827 in Gardner MA, and died Aft. 1862. She married (2) FRANCIS A CRONEY 16 Apr 1865 in Orange/Athol MA, son of FRANCIS CRONEY and ELIZABETH ?. He was born Abt. 1826 in VT, and died Bet. 1880 - 1910.
i. GEORGE L7 COWEE, b. 08 Jan 1852, Ashburnham/Boston MA; d. Aft. 1900. 8. ii. WILLIAM N COWEE, b. Jun 1856, MA; d. Aft. 1920.
iii. ALFRED LEONE COWEE, b. 16 Mar 1862, Salem MA; d. 08 Oct 1863, Gardner MA. iv. HATTY ELIZABETH7 CRONEY, b. 13 Feb 1866, Athol MA; d. Aft. 1880. 9. v. FREDERICK ANSEL CRONEY, b. 20 Dec 1868, Athol MA; d. Aft. 1910.
vi. EFFIE A CRONEY, b. Abt. 1877, MA; d. Aft. 1880. 4. THEODORE A6 HOLDEN (JOSHUA HEMENWAY5, JOSHUA4, DAVID3, JOHN2, STEPHEN1) was born Dec 1834 in Gardner MA, and died Aft. 1910. He married HANNAH J QUIMBY in by 1857, daughter of THOMAS C QUIMBY. She was born Abt. 1836 in Sandwich NH/Warwick MA, and died Bet. 1880 - 1910.
i. SON7 HOLDEN, b. Abt. 1857, Hubbardston MA; d. 17 Aug 1857, Hubbardston MA. ii. FRANK EUGENE HOLDEN, b. 05 Jun 1860, Gardner MA; d. Aft. 1899; m. MARY A KAHLER, 22 Jan 1899, St Croix WI. 10. iii. SARAH JANE HOLDEN, b. 21 Jun 1866, Gardner MA; d. Aft. 1940.
iv. NELLIE HOLDEN, b. 08 Mar 1868, Gardner MA; d. Bef. 1870. 11. v. LEOLA BELLE HOLDEN, b. Mar 1872, WI; d. Aft. 1900. 5. JOHN H6 HOLDEN (JOSHUA HEMENWAY5, JOSHUA4, DAVID3, JOHN2, STEPHEN1) was born Abt. 1842 in MA, and died Bet. 1880 - 1900. He married MARY JANE MEACHAM 15 Sep 1868 in Athol MA, daughter of GEORGE MEACHAM and MARTHA STRATTON. She was born Abt. 1852 in MA, and died Aft. 1930.
i. ALICE E7 HOLDEN, b. Abt. 1869, MA; d. Aft. 1940; m. FRED F CLARY, 27 May 1891, Athol MA; b. Abt. 1868, ME; d. Aft. 1920. 6. HORACE NELSON6 HOLDEN (JOSHUA HEMENWAY5, JOSHUA4, DAVID3, JOHN2, STEPHEN1) was born 03 Jul 1846 in Gardner MA, and died 29 Jan 1906 in Boston MA. He married GALDYS P MABY 27 Jul 1891 in Ware MA. She was born Jul 1866 in Canada, and died Aft. 1930.
i. HERBERT N W7 HOLDEN, b. Aug 1892, MA; d. Aft. 1930. 7. ELLA MARIA7 HOLDEN (FRANCIS6, JOSHUA HEMENWAY5, JOSHUA4, DAVID3, JOHN2, STEPHEN1) was born 30 Nov 1853 in Gardner MA, and died 1926. She married THEODORE WHITNEY LEARNED 31 Dec 1873 in Gardner MA, son of WILLIAM LEARNED and MARIETTA WHITNEY. He was born 31 Dec 1851 in Gardner MA, and died 1938.
i. EVERETT FRANCIS8 LEARNED, b. 09 Feb 1878, Gardner MA; d. 30 Jul 1878, Gardner MA. ii. BIRDYS E LEARNED, b. 26 Apr 1882, Gardner MA; d. 09 May 1882, Gardner MA. iii. WESTON T LEARNED, b. 28 Feb 1884, Gardner MA; d. 1884. 8. WILLIAM N7 COWEE (HARRIET6 HOLDEN, JOSHUA HEMENWAY5, JOSHUA4, DAVID3, JOHN2, STEPHEN1) was born Jun 1856 in MA, and died Aft. 1920. He married CORA B NICKERSON 14 Feb 1880 in Athol MA, daughter of CYRUS NICKERSON and SARAH ?. She was born Dec 1860 in MA, and died Bet. 1910 - 1920. 12. i. GRACE G8 COWEE, b. 13 Apr 1881, Athol MA; d. Aft. 1920. 13. ii. CLIFTON EUGENE COWEE, b. 20 Nov 1884, MA; d. Aft. 1940. 14. iii. FLORENCE ADELAIDE COWEE, b. 30 Jan 1891, Ware MA; d. Aft. 1940.
iv. GEORGE GARFIELD COWEE, b. Abt. 1894, Ware MA; d. 28 Jun 1894, Ware MA. 15. v. BEATRICE I COWEE, b. Jul 1898, MA; d. Aft. 1940. 9. FREDERICK ANSEL7 CRONEY (HARRIET6 HOLDEN, JOSHUA HEMENWAY5, JOSHUA4, DAVID3, JOHN2, STEPHEN1) was born 20 Dec 1868 in Athol MA, and died Aft. 1910. He married MARY THERESA SULLIVAN 18 Apr 1906 in Holyoke MA. She was born Abt. 1880 in Ireland, and died Aft. 1910.
i. FRANCIS A8 CRONEY, b. Abt. 1909, MA; d. Aft. 1910. 10. SARAH JANE7 HOLDEN (THEODORE A6, JOSHUA HEMENWAY5, JOSHUA4, DAVID3, JOHN2, STEPHEN1) was born 21 Jun 1866 in Gardner MA, and died Aft. 1940. She married WILLIAM M GROSS 21 Nov 1889 in River Falls WI. He was born Aug 1872 in MN, and died Bet. 1920 - 1940.
i. EFFEL8 GROSS, b. Apr 1892, MN; d. Aft. 1900.
ii. THEODORE GROSS, b. 06 Feb 1894, St Paul MN; d. Aft. 1910.
iii. MARSHALL EVERETTE GROSS, b. 01 Apr 1897, St Paul MN; d. Aft. 1920. 16. iv. ILO GROSS, b. 22 Jan 1906, Fort Atkinson WI; d. Oct 1979, Washington WI. 11. LEOLA BELLE7 HOLDEN (THEODORE A6, JOSHUA HEMENWAY5, JOSHUA4, DAVID3, JOHN2, STEPHEN1) was born Mar 1872 in WI, and died Aft. 1900. She married ROBERT WARREN STEINERS 06 Dec 1893 in St Croix WI, son of JACON STEINERS and ANNA NEWBY. He was born Oct 1866 in Canada, and died Aft. 1900.
i. WARREN K8 STEINERS, b. Jan 1896, ND; d. Aft. 1900.
ii. ROLAND EARLE STEINERS, b. 19 Feb 1900, Chicago IL; d. 27 Mar 1911, Essex Ontario Canada. 12. GRACE G8 COWEE (WILLIAM N7, HARRIET6 HOLDEN, JOSHUA HEMENWAY5, JOSHUA4, DAVID3, JOHN2, STEPHEN1) was born 13 Apr 1881 in Athol MA, and died Aft. 1920. She married LYMAN J ROBBINS 01 Jan 1898 in Ware MA. He was born 18 Aug 1877 in Hardwick MA, and died Bet. 1910 - 1920. 17. i. LYMAN N9 ROBBINS, b. Abt. 1902, MA; d. Aft. 1930. 13. CLIFTON EUGENE8 COWEE (WILLIAM N7, HARRIET6 HOLDEN, JOSHUA HEMENWAY5, JOSHUA4, DAVID3, JOHN2, STEPHEN1) was born 20 Nov 1884 in MA, and died Aft. 1940. He married CATHERINE M SHELDON 22 Dec 1906 in Belchertown MA. She was born Abt. 1887 in MA, and died Aft. 1930. 18. i. STANLEY EUGENE9 COWEE, b. 27 May 1907, Whately MA; d. 16 Jun 1991, Southwick/Springfield MA. ii. RICHARD MOON COWEE, b. 07 Oct 1909, Belchertown MA; d. Aft. 1930.
iii. CLIFTON E COWEE, b. 15 Jun 1912, MA; d. 25 Mar 1983, Springfield MA. iv. CATHERINE E COWEE, b. Abt. 1919, MA; d. Aft. 1940. 14. FLORENCE ADELAIDE8 COWEE (WILLIAM N7, HARRIET6 HOLDEN, JOSHUA HEMENWAY5, JOSHUA4, DAVID3, JOHN2, STEPHEN1) was born 30 Jan 1891 in Ware MA, and died Aft. 1940. She married HARRISON N SHELDON 29 Apr 1911 in Ware MA. He was born Abt. 1890 in MA, and died Aft. 1940. 19. i. HARRISON NELSON9 SHELDON, b. 14 Apr 1912, Milford MA; d. Aft. 1940.
ii. BEATRICE CLAIRE SHELDON, b. 06 Feb 1915, Hopedale MA; d. Aft. 1920. 15. BEATRICE I8 COWEE (WILLIAM N7, HARRIET6 HOLDEN, JOSHUA HEMENWAY5, JOSHUA4, DAVID3, JOHN2, STEPHEN1) was born Jul 1898 in MA, and died Aft. 1940. She married FRANK S BROWN 29 Nov 1915 in Uxbridge MA. He was born Abt. 1892 in MA, and died Aft. 1940.
i. KENNETH F9 BROWN, b. Abt. 1917, MA; d. Aft. 1940.
ii. ELLIOTT W BROWN, b. Abt. 1918, MA; d. Aft. 1940.
iii. ELEANOR J BROWN, b. Abt. 1920, MA; d. Aft. 1930. 16. ILO8 GROSS (SARAH JANE7 HOLDEN, THEODORE A6, JOSHUA HEMENWAY5, JOSHUA4, DAVID3, JOHN2, STEPHEN1) was born 22 Jan 1906 in Fort Atkinson WI, and died Oct 1979 in Washington WI. He married HENRIETTA ?. She was born Abt. 1908 in WI, and died Aft. 1940.
i. THOMAS9 GROSS, b. Abt. 1938, WI; d. Aft. 1940. 17. LYMAN N9 ROBBINS (GRACE G8 COWEE, WILLIAM N7, HARRIET6 HOLDEN, JOSHUA HEMENWAY5, JOSHUA4, DAVID3, JOHN2, STEPHEN1) was born Abt. 1902 in MA, and died Aft. 1930. He married GRACE G ?. She was born Abt. 1897 in MA, and died Aft. 1930.
i. LYMAN N10 ROBBINS, b. Abt. 1924, MA; d. Aft. 1930.
ii. GERALD W ROBBINS, b. Abt. 1929, MA; d. Aft. 1930. 18. STANLEY EUGENE9 COWEE (CLIFTON EUGENE8, WILLIAM N7, HARRIET6 HOLDEN, JOSHUA HEMENWAY5, JOSHUA4, DAVID3, JOHN2, STEPHEN1) was born 27 May 1907 in Whately MA, and died 16 Jun 1991 in Southwick/Springfield MA. He married DOROTHY N ?. She was born Abt. 1909 in CT, and died Aft. 1940.
i. WILLIAM10 COWEE, b. Abt. 1930, MA; d. Aft. 1940.
ii. GERALD COWEE, b. Abt. 1936, MA; d. Aft. 1940. 19. HARRISON NELSON9 SHELDON (FLORENCE ADELAIDE8 COWEE, WILLIAM N7, HARRIET6 HOLDEN, JOSHUA HEMENWAY5, JOSHUA4, DAVID3, JOHN2, STEPHEN1) was born 14 Apr 1912 in Milford MA, and died Aft. 1940. He married FLORENCE ?. She was born Abt. 1913 in VT, and died Aft. 1940.
i. DOROTHY10 SHELDON, b. Abt. 1937, VT; d. Aft. 1940.